India and China find that pragmatic flexibility trumps ideology in trade policies. Case in point: Israel. Business and strategic circles in New Delhi are abuzz with talk that Tel Aviv is moving closer to Beijing, with potential strategic implications for the security architecture of South Asia. Concerns have been triggered by both booming Sino-Israeli trade and ongoing military transactions. The shift raises questions about the possible repercussions for India’s own relations with China and Israel. Admittedly, Sino-Israeli relations have been growing for the last three decades, particularly following the establishment of diplomatic relations between the two counties in 1992. During the Cold War, however, relations were bumpy, given the strategic considerations that drove Beijing’s policy agenda in the Middle East and South Asia. The situation began to change rapidly after the Soviet invasion of Afghanistan in 1979, when China began to look for ways to support the Pakistan-U.S.-Saudi-Israeli strategy. That provided a first opening for Beijing to quietly develop ties in strategic areas, including military transactions. Interestingly, these strategic transactions continued for a decade before Beijing established formal diplomatic ties. Moreover – and to Washington’s surprise – there has been very little change in the Sino-Israeli military relationship. Clearly, since 1992, the Sino-Israeli relationship has become increasingly robust and mature. Over the years, bilateral trade has expanded in vital areas. 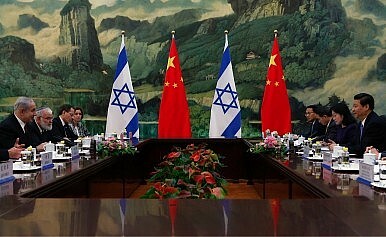 In 2009, China was Israel’s 11th-largest foreign market; by 2012, it was second only to the United States. The last two decades have seen high-level exchanges, helping to strengthen political trust. China is currently Israel’s largest trading partner in Asia and the third-largest worldwide. Projections have Israel’s annual trade with China rising from a two-way volume of $8 billion in 2012 to $10 billion over the next half-decade. This could include stronger cooperation in high-tech sectors, joint construction of industrial parks and technology transfer centers, and a boost in agricultural cooperation. This is in addition to strengthening China’s soft power potential by facilitating cultural exchanges such as the celebration of the 20th anniversary of diplomatic relations between China and Israel and “Experience China in Israel.” Confucius Institutes have been set up within Tel Aviv University and The Hebrew University in Jerusalem, offering Israelis a platform to learn about Chinese culture. The path of India-Israel relations has not been dissimilar. Initially, India-Israel ties were rocky, not helped by the Cold War. India was perhaps the first postcolonial country to have opposed the partition of Palestine and the creation of Israel in 1948. New Delhi refused to establish diplomatic relations until 1992, when the political situation in West Asia transformed following the shift in stance of the Palestine Liberation Organization that eventually led to the Oslo Accord. The change of global political climate after the breakup of the Soviet Union, which forced New Delhi to “Look West,” helped strengthen ties with Tel Aviv. The liberalization drive in India reinforced relations in vital areas. India’s emerging ties with the U.S. helped. As a consequence of this thawing, India-Israeli trade volumes have grown from a modest $200 million in 1992 to reach $5.15 billion in 2011 and $6 billion in 2012-13. Both nations have experienced a convergence of interests in agriculture, farm research, science, public health, IT, telecom and cooperation in space. Israeli business is also keen to take advantage of synergies with India in areas such as water technologies, information technology and sectors where Israel excels. Meanwhile, India-China relations have developed rapidly over the last two decades, notwithstanding border tensions. From a modest $2.92 billion in 2000, two-way trade had ballooned to $66 billion by 2012. China became India’s top trading partner during the 2008-9 fiscal year, dislodging the U.S. The two countries issued a forecast in 2012 suggesting that bilateral trade would hit $100 billion by 2015. Though India runs a large trade deficit with China, this is not surprising given China’s current state of development. And like Israel, India has also been building military cooperation with China in vital areas such as counter-terrorism and maritime security. What scope is there for engagement among these three actors: New Delhi, Beijing and Tel Aviv? This depends on a number of factors, including comparative advantages in trade and other transactions.